Keywords: Alice in Wonderland, brilliant, connected, public playspace, transformational flow, being and nothingness, Art. All the inquiry of the Greek philosophers seems to have this in common: it is rooted in the principle that a thing cannot materialize from nothingness nor can it dissipate into nothingness - existence and non-existence cannot give rise to one another. This is an interesting notion. Michelle Teran is a self- professed game master and a perpetual child at play. She is in the process of mastering her favourite and deceptively simple subject the art of play. What intrigues me most about Terans work is the complexity of her sub-text discourse that she generates by her careful choice of mediums, materials or tools and classical/pop art references. Take her AFK series, for instance. In my mind, there are clearly layers of interactions between subject, tools and conceptual discourse on being and nothingness, boundaries and space, alienation and connection, anonymity and voyeurism, public and personal perception that she is attempting to make into a physical art-form. Of course, it could just be that I like playing with myself-you know what they say? And I do love Mind games! That, and her wonderful visions of what constitutes a gameboard. Check out "2.4_interaction_interference. Of course she doesnt work alone. She shows a clear enjoyment of social exchange, calling across time and continents on a bevy of talented peers such as Jeff Mann, Isabelle Jenniches and Amanda Ramos to assist in her collaborations. But is it ART? YB Yeats once wrote: Art bids us to touch and taste and hear and see the world, and shrinks from what Blake calls mathematical form, from all that is of the brain only, all that is not a fountain jetting from the hopes, memories and sensations of the body. Now, you may argue the relevance of this test in the post- modern art world or even whether it is valid to apply to new media art, based in virtual reality. Some would say it is this, the alienation of body, that is the very failing of new technologys virtual tools as artform. But I think that is, in fact, Terans challenge. Bringing into being and body experience that which is not. This facet of her work may best be seen in her collaboration with a group of kinetic artists in the ongoingLiveform: Telekinetics. As she says, she stays away from "conventional" art spaces because it does not allow her to engage in the types of activities that she needs. She seeks out working environments and spaces where useful types of conversations can occur. So some may say she is only playing. Yet from where I sit, the lessons learned and art created is just more of what the world needs now. AFK stands for 'Away from Keyboard'. These and many other abbreviations are commonly used in online chat rooms and on mobile phones to send SMS messages. Michelle says she was inspired by SMS vocabularies and by how much of these acronyms consist of utterly banal, superficial utterances and thinly veiled pick- up lines found on most chatlines. In this play experiment she chose to limit the variables by limiting the number of players (using enlisted artists only) but allowing the game board to shift somewhat without her control, both in time and in framing. The game was essentially a playful instructional interaction between Michelle and Isabelle. The exercise to find and piece together within the AFK clutter, statements that have some kind of meaning. A still image projected at a set frequency, a slow moving tableau, the players impact was slowly eroded or altered as a result of the interaction of the landscape weather or intervening and often unwitting public passer-by's. It is an interesting interplay between message and space, and the transformative power of representative information, context and social interaction. The object of the game, therefore, was to create condensed characters that could make comments about mobility without being too trite. The algorithm or rules by which the players interacted: the enlisted artists were given a list of performance instructions online: i.e. assignment for ij: * Chalk your message on the Embarcadero behind the 'Good Clean Fun'. -When the first symbol is completed, talk to a passerby. -When the third symbol is completed, wave to Jim in the Smokehouse. -When the entire message is completed, pose with surfers next to the drawing. 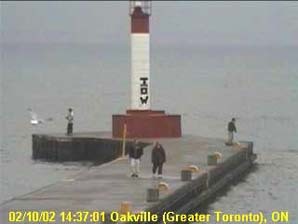 The gameboard: Urban and rural landscapes whose view were framed by live public web cams across Canada and the US, which were than simultaneously linked to the performance host site.The webcams were installed and operated by agencies such as weather channels, port authorities, municipal departments and tourism boards. 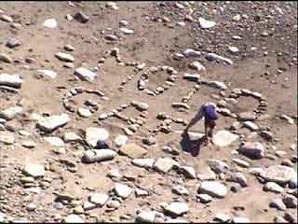 In the AFK series, each performance involved sending a message coded in this abbreviated way, in front of public webcams, within the context of the local landscape. The short messages describe instances of mobility, presence and different modes of communication. The gameboard pieces and players: Of course the chess match was between the artists. But they also were both interested in the play between technologies and experience. It was playing between spaces-taking a 2D screen language used within these digital disembodied spaces, and mapping them onto these immense hyper-sensorial physical spaces. The result would be an interplay between experiences: that of navigating between vast physical and virtual environments and watching this action from the comfort of your computer screen. They were intrigued by how sometimes these two worlds bled into each other, for example, when they contacted each other by phone. The visual message was grabbed in moments of time, the virtual image crawling through physical space. The audience viewing the message then became the passive players, and the message image told you that others were or had been playing too. Laying the cryptic messages at others unseen hand, following rules that become manifest only by consent, is a lesson in the marking of time and the making of history. Through this game the image then becomes a representational drama on the making of civilization. 2.4_interaction_interference: In this game, the gameboard was set and somewhat defined by the players desire to be seen, but the border details were unknown. There were instructional rules in place, players were captured by nodal receivers, but the other variables left somewhat open. Anyone could enter the play space. Everyone was invited to play, but the number of simultaneous players was limited by the physical resources available. The object of the game: Map the gameboard. Bicycles were rigged with wireless cameras, easily available and increasingly used for home and small business security monitoring systems. The cameras wirelessly transmit over the 2.4 frequency band. Once thought to be an unpopulated territory, it has now become crowded with cordless phones, 802.11 compliant LAN wireless systems, Bluetooth and other RF solutions. In this increasingly cluttered zone, toes get stepped on, interference happens. The gameboard pieces: The players were asked to ride the bikes through the urban public spaces, thereby recording their path and capturing images with their mounted camera. A central hub receiver recorded and archived the complete live visual mapping of the defined zone. Michelle used bright colours of yellow and orange to mark the riders, their instruction cards and bikes. This helped to distinguish the game from the background visual noise, and to engage players from members of the public randomly walking by or from the ranks of interested festival audience. These colours also had significance and competition from public signage such as municipal works (waste trucks, emergency barriers etc). Along the route, TV receivers were placed in commercial shop windows. This added the dimension of commerce as public space. Players became creative actors moving through this space. They could view images of themselves and their cameras eye view reflected back to them by the shop receivers, as they moved through the city zones. People, part of the mapped landscape, curiously stopped to talk and interact with the players and also became engaged. 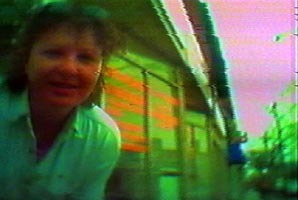 The number of cameras in use, their proximity to each other and to the receiver, interference by other inhabitants in the area, were all variables that affected the produced video image. Liveform Telekinetics 2002: The latest in her progressions. This is Alice at the Mad Hatters tea party. A game of telekenetics. Teran wanted a way to consolidate and explore the artistic and technical possibilities of the current state of interactive tools. She also wanted to inspire others. Instead of taking the ho- hum lets get together and talk-conference, show me yours and Ill show you mine route, she invited us all to dinner! Of course it was potluck, and the list of interactive guests included playmates in Amsterdam, Norway and Toronto. At each dinner the physical spaces a huge dinner table, was linked through a looking glass door that stretched out onto infinity. The screen covering the door was in fact a viewing port to link the projected images of all the guests in each country. 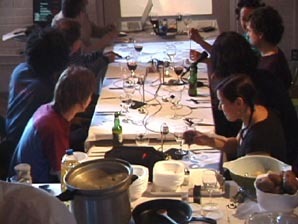 Images of virtual food and transcribed text (as a technical failure back-up)from one city were projected onto the physical presence of the dinner table in another. I found that these images and the ones transmitted through the portal door were actually very beautiful and quite moving. In the final dinner, objects such as the wine glasses, bottles and cutlery were also linked telekinetically. The sound of the clinking of the wine glasses by guests for a musical performance in one city dinning room, would cause the spoons (automated and attached ) of wine glasses to clink in another city dinning room. Food was used as sculptural objects but also as play. Fish would mouth the words in Toronto, as a guest in Amsterdam would sing. As one child, mouth full and laughing, asked in broken englishwhats that youre eating? another would answer across the miles. Each was in the play of eating together and the soothing comfort that one gets from sharing food, but now it was extended across the world. The series of work-shopping dinners took place over several months. 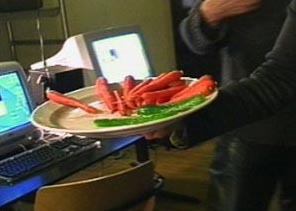 Each dinner instructed her in the limitations and possibilities of the elements, for example of the chaos of too many players, or communicating rules across space and cultures, image interference, technical failures and virtual objects as play toys.